How is spring coming along over there? We’ve been enjoying a bit of spring weather, warm days, an occasional shower, cold mornings and such. I was just getting used to short-sleeved shirts when now the cold is back. And I don’t like that. We’ve managed to do some work in the garden, but have not planted anything yet, as I am waiting for the cold to pass. And while raining, we were organizing our home a bit, just cleaning up, throwing stuff away and tidying up. It’s an ongoing process still. I feel like we’ve been throwing stuff away for the past couple of years, and every time we clean, we find new things, unused and unwanted. Since we moved to our new home a couple of years back, we’ve still had a couple of boxes of stuff laying around. It’s funny how you think you absolutely need something when you move, and then that thing ends up staying in a box for years, untouched. Mitja is quite the minimalist, and I am becoming more and more one myself, as I embrace the art of having less. It’s been months since we went shopping for clothes. When we think we need something, we give it a thought first and then try to find the best solution for our needs – one that we would both like and really enjoy. One of the few stores we’ve been to in the past months, besides groceries, is Ikea because we’re still furnishing. And I am thrilled we’ve finally come to the wardrobe part, so we can better organize our clothes, backpacks, socks and stuff. We’ve reduced our wardrobes significantly, following the steps of Marie Kondo and finding out, she must have a point after all. Although I was rather reluctant of getting rid of my clothes, the experience is liberating and I find myself not missing those old shirts or skirts, at all. I would much rather have a smaller wardrobe of clothes that I adore and enjoy wearing than shelves and drawers stuffed to the brim of stuff I know I am never going to wear again. Did you ever do a complete cleanup? How did you find the experience and the end result? So, in the upcoming days, this is what we will be doing, mainly. Throwing stuff away and donating things and clothes that could still be used. 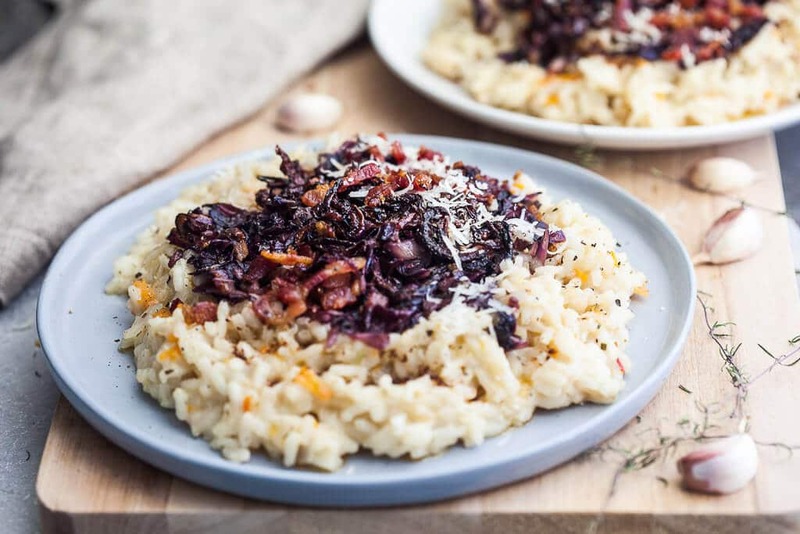 But before I sign off, let me share this Grilled Radicchio Risotto that is an ideal dish in sour weather. 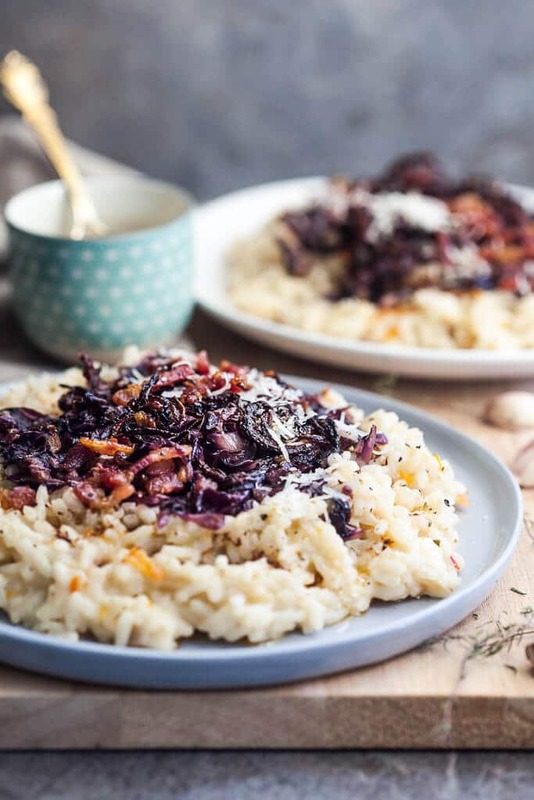 This Grilled Radicchio Risotto uses just a couple of ingredients, but packs plenty of flavors! 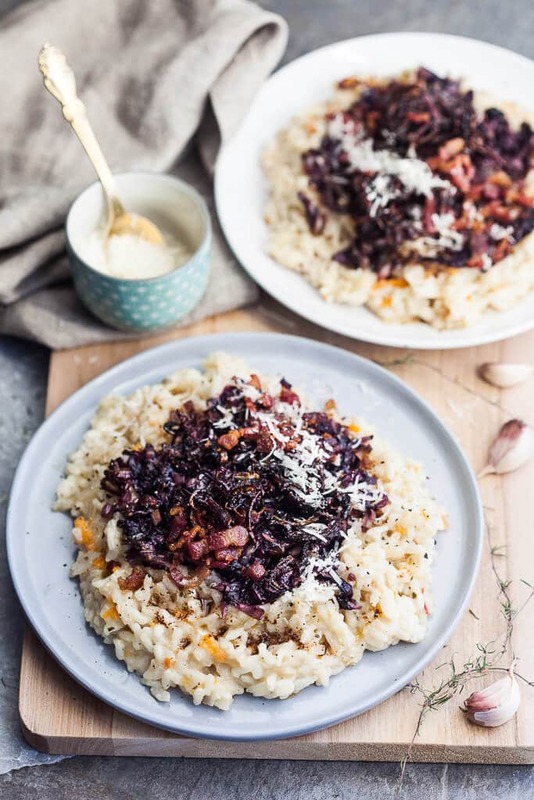 And though we mostly keep a vegetarian diet, a little bit of bacon will not hurt us… but you can – of course – just omit it and make the dish completely vegetarian! 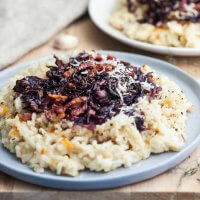 Peel and finely slice onions and garlic. Peel and grate carrot. Roughly dice bacon. Wash radicchio, dry and slice roughly. In a pot, heat some olive oil, then add yellow onions and carrots. Fry until the onions turn golden brown, then add rice and stir in well. Pour over the vegetable stock, give it a stir, and let it cook for about 10-15 minutes, stirring occasionally. At this point, add a little water as needed and keep stirring occasionally, until the rice is cooked through. Give it a taste and add salt as needed. While the rice is cooking, heat a grill pan and add some olive oil. Then, add finely sliced red onion, sliced or diced garlic and diced bacon. Fry until the onions tenderize and the bacon fries up, then add sliced radicchio and mix in well. Season to taste with salt and pepper, then let it cook for a couple of minutes, until the radicchio wilts down. Remove from heat and set aside. 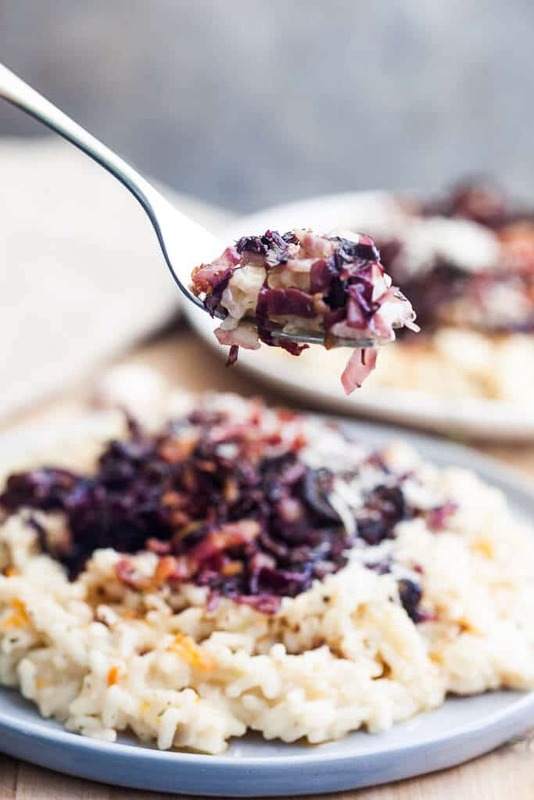 Place cooked rice on a plate a top with the cooked radicchio, pouring over any leftover juices from the pan. 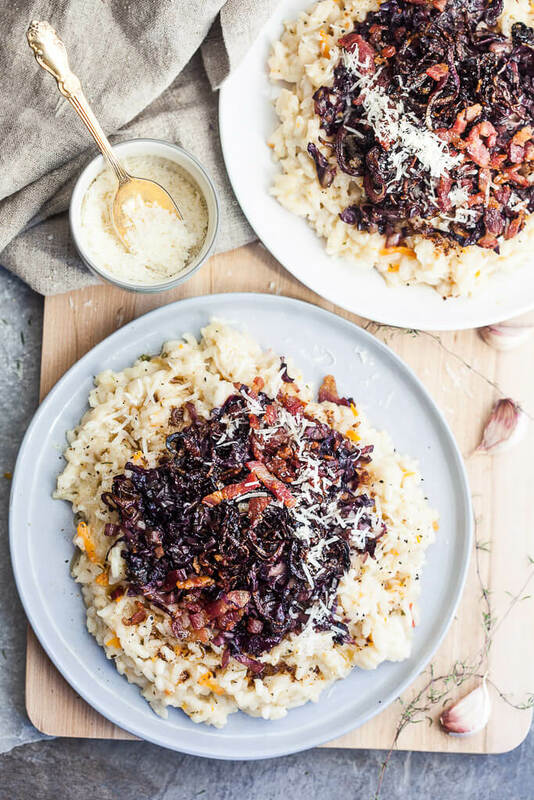 Top with grated parmesan and serve.